Entered Army 1868, Career in Royal Engineers. Conducted extensive surveys in Palestine and Cyprus. Governor General Eastern Sudan 1886. Commanded victorious forces at Battle of Omdurman 1898. Commander-in-Chief, South Africa, Boer War 1900-1901. When Great Britain declared war in August 1914, Kitchener was in England. He was asked by the Prime Minister, Herbert Asquith to become Secretary of State for War. 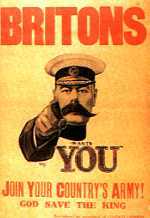 Kitchener became the symbol of the British war effort when he appeared on a recruiting poster. The poster was a picture of Kitchener, walrus mustache and all pointing toward the viewer. Kitchener's view of the war was at variance with the conventional wisdom. He shocked his cabinet colleagues and the Army high command with his prediction that the war would last years no, not months. His greatest contribution was the raising and equipping of "New Armies" that would play a critical role in Britain’s war effort in 1916 and 1917. Unfortunately, a great number of the young men who volunteered for the "New Armies" would die at the Somme and Passchendale. Kitchener's autocratic ways soon put him at odds with other members of the Cabinet, and with the ranking officers in the BEF. 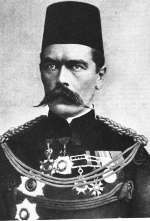 His role in the Gallipoli campaign - failure to recognize the need for army forces to capture the peninsula in coordination with the naval campaign to force the Straits , and his support of continued operations in the face of bitter opposition from the "Westerners" (i.e. those who claimed that the Western Front was the only decisive theater of the war) led to his being eased from power. He drowned when the cruiser carrying him on a mission to Russia was mined and sunk off the Orkneys. "I must say I like having the whole thing cut-and-dried and worked out." Kitchener during the Boer War. "We have to make war as we must and not as we would like to." The Field Marshal on the Gallipoli campaign.